Lake O’Hara is one of the most beautiful spots in the Canadian Rockies. 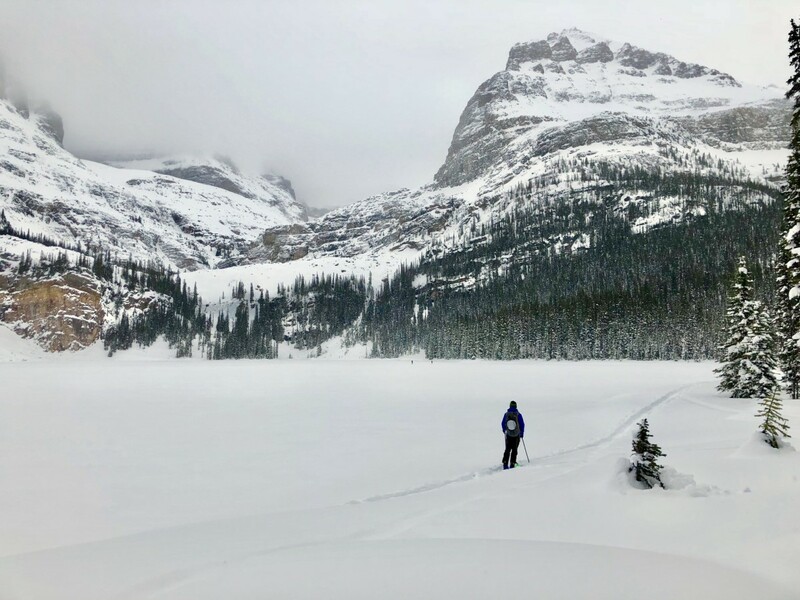 Winter is a great time to visit, as it’s easier to get a reservation at the ACC Hut or Lake O’Hara Lodge since you must make the 11km ski or snowshoe into Lake O’Hara yourself. The route in is along a fire road, and once in the region there are some nice tours for those with avalanche training.  If arriving by air, fly into Calgary (YYC) and rent a car. The drive to the trailhead is wonderful, and takes about 2h 15 minutes from the airport, though can be longer if it’s snowing. Along the way you pass Banff and Lake Louise, and many people combine a trip to Lake O’Hara with a stay in one of those towns. The stand-out hotels in both towns are Fairmont hotels, with the Banff Springs Hotel and Chateau Lake Louise being highlights of a stay in the Rockies. About 15 minutes past the trailhead lies the charming town of Field, which unfortunately is mostly closed in winter, except for the wonderful Truffle Pigs Lodge and Bistro. Up a winding road near Field is Emerald Lake Lodge, another great lodge for winter adventures. 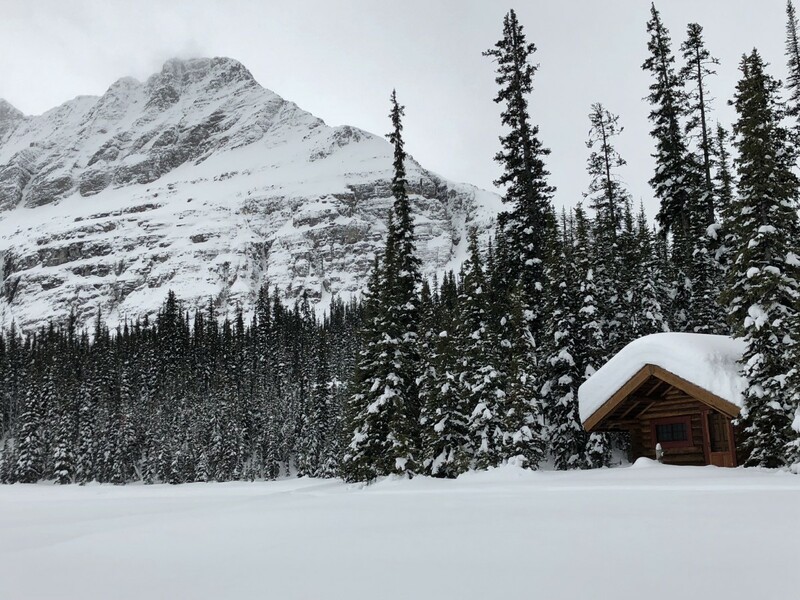 The big choice in coming to Lake O’Hara in winter is where to stay and for how long. Most people to go Lake O’Hara for anywhere from 1 to 3 nights. Remember that the only way to access either is via an 11km ski or snowshoe in! There are only two choices of accommodation at Lake O’Hara, and you need to reserve in advance as they book up quickly. The ACC Elizabeth Parker Hut is a low-cost historic gem. Lake O’Hara Lodge is more expensive, but still good value to stay in a guided, historic, luxury lodge. If you choose the Elizabeth Parker Hut you’ll be in one of two log cabins built either in 1912 or 1919. While there are sleeping mats, wood stove, gas cooking stoves and utensils, you’ll need to bring your own food and sleeping bag. While you’re there, you will share the space with up to 20 others, and yes, snoring is an issue. You will also need to make your own water by melting snow. Make sure you keep the area for getting snow clear of waste!!! Costs are very cheap at the Elizabeth Parker hut, running $30 per night for ACC members and $40 per night if you’re a non-member. Lake O’Hara Lodge is a luxury lodge, constructed in 1925-26 by the Canadian Pacific Railway. 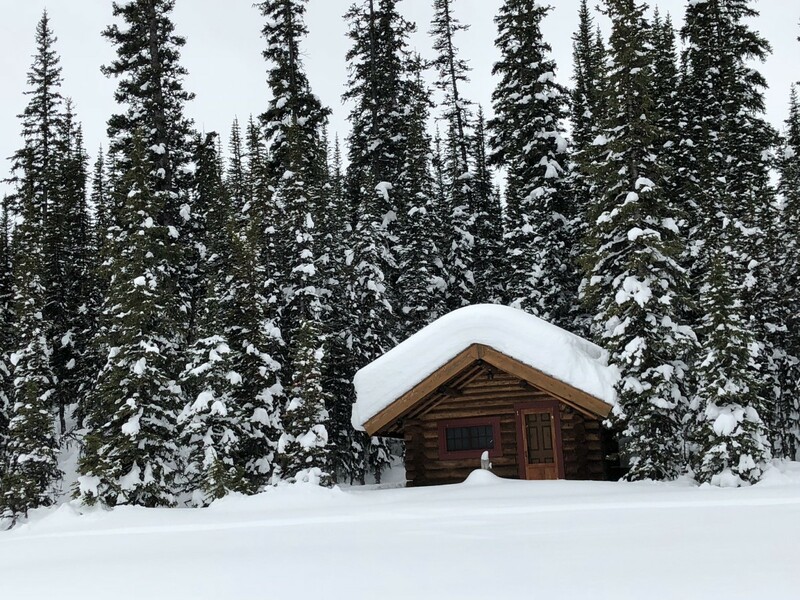 While in summer the cabins along Lake O’Hara may be the most beautiful places on earth, in winter they are closed, and all guests stay in the Lodge. The lodge is incredibly comfortable, and the food is terrific. There is even a sauna to help you relax your muscles. Capacity in winter is a only 16 guests, which means you have a lot of space to explore. You also have a guide to take you on adventures in the area, which we love as there are some dangerous avalanche slopes around Lake O’Hara. All this luxury comes at a cost though, with Lodge rooms running $387.50 per person. The winter season is short, from late-January to early-April. Start at the Lake O’Hara parking lot, which is reached from the TransCanada Highway. The trailhead turn-off is between Lake Louise and Field. Due to construction, as of 2018 it’s easy to miss the turn-off, so be vigilant once you pass West Divide Lodge (if you’re heading West). The turnoff is on your left. Park your car in the Lake O’Hara parking lot and then you can XC ski, snowshoe or ski tour up to Lake O’Hara. If we are only going to Lake O’Hara then XC skis are a great way to get there. 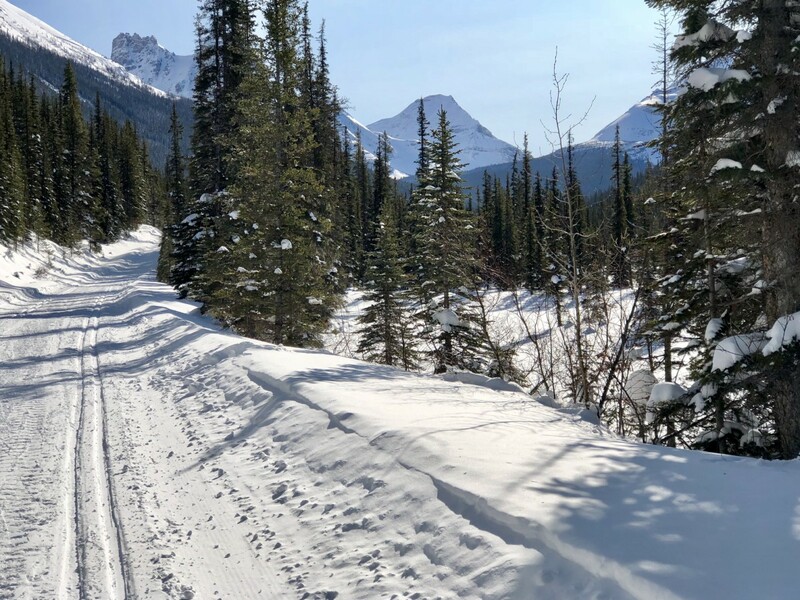 If we are going to be doing some day tours in the O’Hara region then we prefer either snowshoeing or Ski Touring, as the terrain doesn’t lend itself to XC skiing (or light touring) in our opinion. The route up to either lodge is groomed and often track-set. It has 455m of elevation gain over the 11km, however none of the pitches are overly steep. The trip takes anywhere from 3.5h to 6h, however most do it in 4-4.5h (faster if you’re on XC gear and faster still if you don’t have a big pack full of food and gear). The route is almost all uphill, so the way in is harder than the way out. Each km has a marker on a tree, so you can track your progress. You gain elevation for the first 2km and then get a nice flat-ish break until roughly 6km. The last 5km see the majority of the elevation gain. On the way up, there is a picnic table near Watch Tower Creek at 5km. This is a great place for a break, and the views are spectacular. From here the trail is steeper and more challenging all the way to the Lake. As you get near Lake O’Hara you will pass the summer camping ground. Farther along you will come to a series of buildings, a warden cabin on your left and a large log cabin known as Le Relais on your right. Le Relais is open in winter for day-trippers, provided they clean up afterwards. There is wood and a stove inside. To get to the Elizabeth Parker hut, look for a path that goes right through the trees just before Le Relais. This path goes up slightly, and due to the amount of snow and narrow trail it is terrible if you are on XC skis, as you can’t get your skis wide enough to make a V to ascend. You’ll see some foot-prints in the snow from people who had to take their skis off. If you’re going to Lake O’Hara Lodge, continue on the main trail past the Ranger Station and Le Relais to the Lodge. Get ready to be greeted by hot drinks and fresh baked goods. Settle into absolute comfort. If you’re there early you may be able to catch an afternoon tour with the guide! There are several day trips possible from either lodge. If you’re at Lake O’Hara Lodge, we definitely suggest you let your trained guide lead you on your day. If you’re at the ACC hut you don’t have a guide, so you’re on your own. Don’t blindly trust other ski tracks to follow, as there is no guarantee the people who made them knew what they were doing. 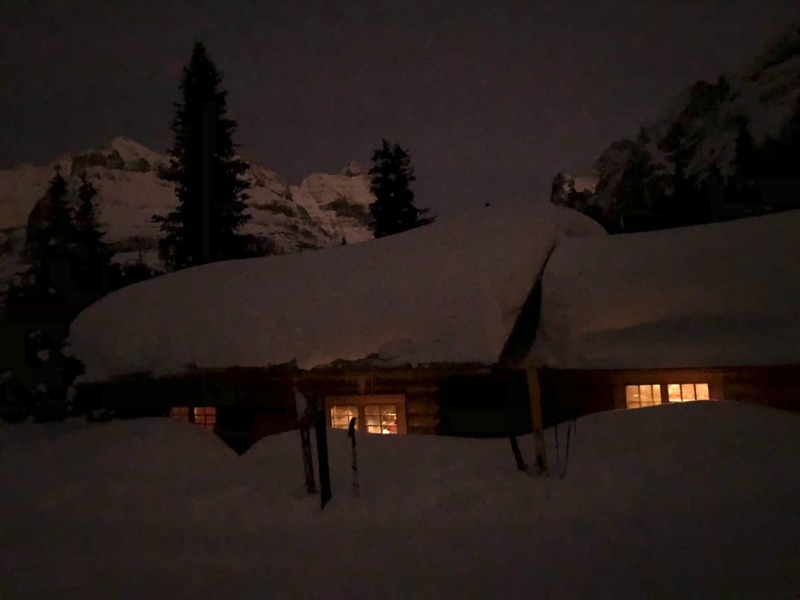 In addition, avalanche conditions can change day-to-day, so the danger may have increased and the route you’re following is now quite dangerous. 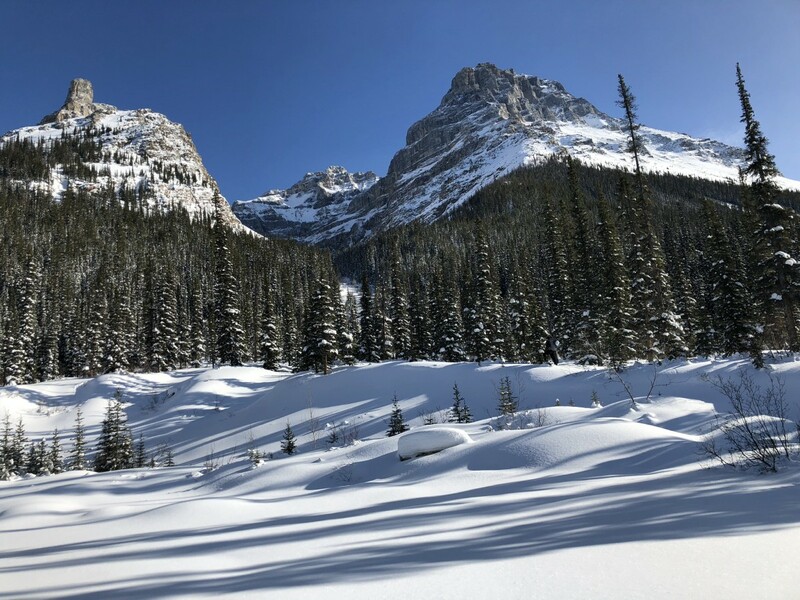 Day trips around Lake O’Hara can include: a ski up to Lake MacArthur, an easy ski on Lake O’Hara or a more demanding trip up to the Opabin Plateau. On our last trip we only went for one night, so our map shows our trip exploring Lake O’Hara before descending. The ski out of Lake O’Hara is a breeze, however there are just enough slight uphills to make it a pain to do without skins. We usually use a bit of kick-wax on our skis to allow us to easily go uphill but not lose the glide on the downhill. It usually takes 2-3h to ski out. Tour around Lake O’Hara, perhaps to MacArthur Lake or up the Opabin Plateau (provided you are trained in avalanche safety). If not, ski on Lake O’Hara.